flowers for flower lovers. 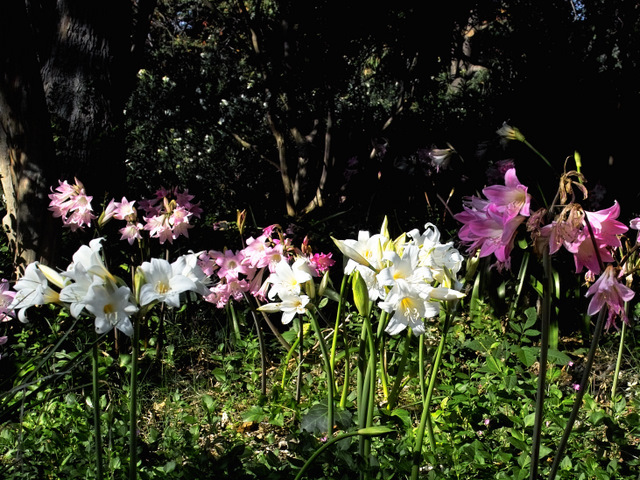 : Naked lady (Amaryllis) Flowers. Naked lady (Amaryllis) Flowers. 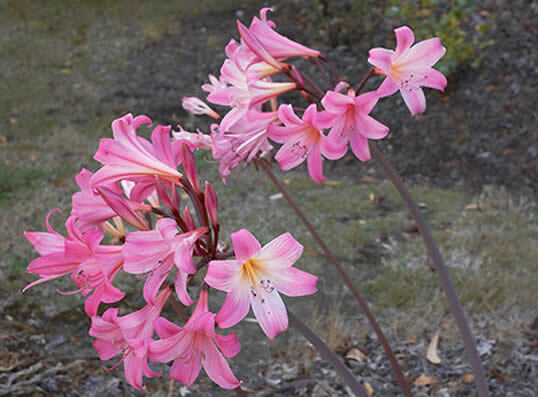 Amaryllis belladonna bulbs are also known as naked ladies because their foliage comes up in early summer, but then dies back. 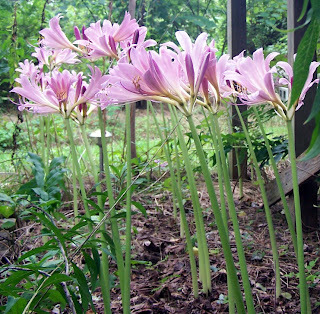 In late summer (August or September) a naked spike resembling a cobra emerges, producing many blooms, usually of a soft pink color, but sometimes white. Naked ladies have an aroma that reminds some people of Bazooka bubble gum. The flowers last for a long time in the garden or in a vase as cut flowers. Two rather different bulbs are commonly called amaryllis. Amaryllis belladonna, from South Africa, is hardy in the Pacific Northwest. It cannot be forced to bloom indoors and should not be confused with the pot-bellied amaryllis bulb sold in autumn to bloom indoors. The latter, although commonly referred to as amaryllis, is reallyHippeastrum. From South America, it is not winter hardy in the Pacific Northwest. 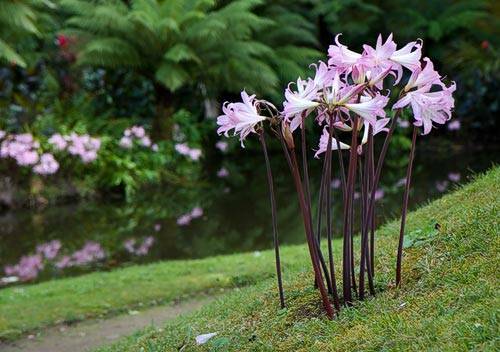 The winter-hardy bulb, Amaryllis belladonna, gets its name from the mythological Amaryllis, a Greek beauty; and the Italian for "beautiful lady" (bella donna). Whenever you see "belladonna" in the botanical world it means that the plant is deadly. Of course, from a gardener's perspective, that can be good because it also means that the plant is deer and rodent resistant. A customer once asked me if naked ladies were poisonous. I looked at him and smiled as his friend said to him, "Dude, you of all people should know that all naked ladies are poisonous." Amaryllis belladonna bulbs were widely cultivated by the Romans and Greeks and later by the Portuguese, Spaniards and Italians. The bulbs are still found in gardens of nobles in major cities, trading ports, church gardens, and around plantation houses of wealthy merchants. According to the classical poets Theocritus, Ovid, and Virgil, Amaryllis was a virginal nymph, timid and shy but with a spine of steel. She fell head over heels in love with Alteo, an icy-hearted shepherd reputed to be as handsome as Apollo and as strong as Hercules. Amaryllis swore that she would be true only to Alteo, no matter what the consequences. Indifferent to her charms, Alteo claimed his only desire was that a new flower be brought to him, a flower that had never before existed in the world. Amaryllis consulted the Oracle at Delphi and was instructed to pierce her heart with a golden arrow at Alteo's door. This she did, dressed in maidens' white, for thirty consecutive nights, dripping blood all the while. The shepherd finally opened his door to discover a flower which had sprung from the blood of her heart. The flower was named Amaryllis. Labels: Naked lady (Amaryllis) Flowers. Colour floral arts designs Patterns. Color Kaleidoscope 2013 new art designs. Colour Kaleidoscope floral art designs 2013. Colour floral lines art Kaleidoscope 2013. Colour Kaleidoscope 2013 floral lines art. Coloured lines floral art designs. Colourful floral shape art designs 2013. Tulip flowers hd desktop wallpapers. Colourful art designs patterns pics. Beautiful flowers HD desktop wallpapers. Colour Kaleidoscope 2013 Floral art designs. Colourful floral shape art designs pictures. Colour ful lines art Flowers designs patterns.